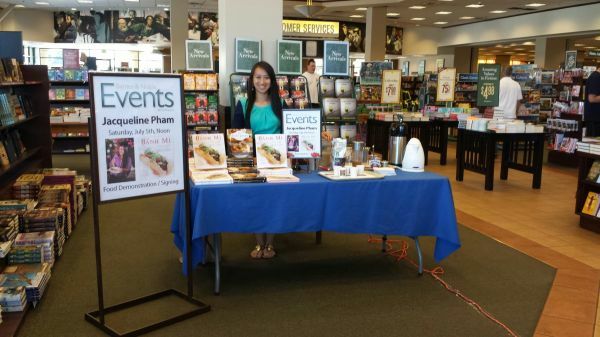 On July 12th, 2014 at 2:00pm the Barnes and Noble at 200 Eastridge Mall #1420, San Jose, CA 95122 will host Chef Jacqueline Pham, best selling author of Haute Potato, Banh Mi and creator of Pham Fatale.com. Her latest book Banh Mi is complete with recipes for classic Vietnamese pickled condiments, flavorful sauces, fresh baked breads, and classic sides, Banh Mi brings the essential tastes of true Vietnamese cuisine into your kitchen. Chef Jacqueline will demonstrate how to make authentic Vietnamese coffee and share her vast knowledge with attendees. After releasing my second best-selling cookbook, "Banh Mi", it seemed pretty obvious to make a tutorial about mastering the art of Vietnamese sandwich making. Making a bánh mì sandwich is really about using a bread roll (preferably a baguette), adding the filling of your choice, Vietnamese-style pickles, lime mayonnaise and quality butter. That's pretty much it. If you want the recipe for each of the elements of a bánh mì, check out my cookbook! There isn't such a thing about a bánh mì not being authentic in my opinion since it's a fusion cuisine adaptation of the traditional jambon-beurre (French ham and butter baguette sandwich). After the colonial period, only wealthy people could afford imported French goods. The organic response was to replicate the French dishes as closely as possible. The Vietnamese sought out and replaced the costly French ingredients they adored with local products. For example pickled carrots and daikon are a substitute for cornichons (the small pickles in the French sandwich). I hope you like my new cooking channel on YouTube. Please subscribe and feel free to send me a message or suggestions for more videos. Thank you for your love and support! We recently had roasted lamb flavored with pomegranate. As usual, I used the leftover meat the following day and prepared my favorite sandwich, a bánh mì of course! You can find the recipe for the baguette, lime mayonnaise and Vietnamese pickles in my second cookbook, aptly entitled Banh Mi. I have to admit a lamb bánh mì is not “authentic”. Having said that, bánh mì is an adaptation of the French baguette sandwich. When the French left Vietnam, some of the ingredients such as the cornichons (French small gherkins) became so costly, they were substituted with local food items (pickled carrots and daikon with cilantro and sliced green chiles). 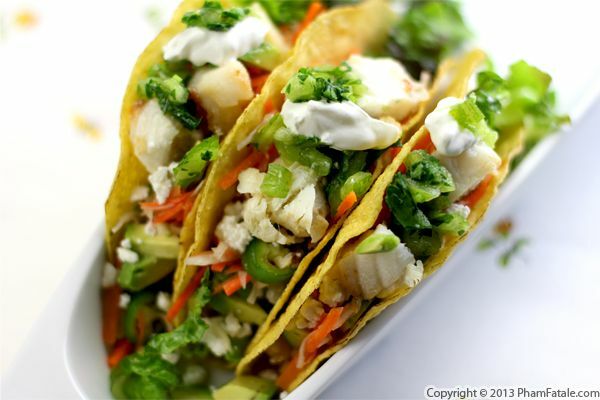 The fillings can be tailored to suit your favorite flavorings. Adaptation and experimentation are why we have the foods we have today, so get in the kitchen and have some fun! A lot of Vietnamese dishes are inspired by French cuisine, because Vietnam was a longtime colony of the French empire. 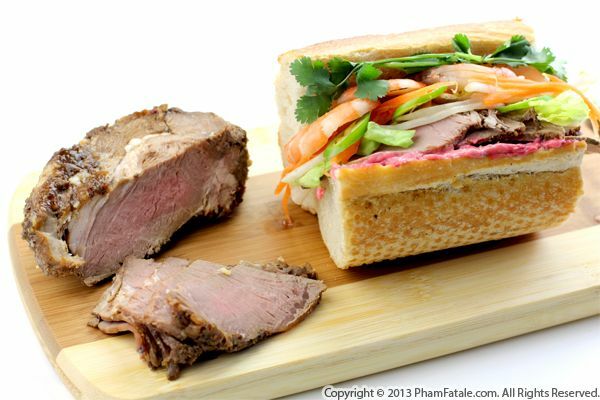 Bánh mì sandwich is an example of a dish that reflects the fusion of both cuisines. 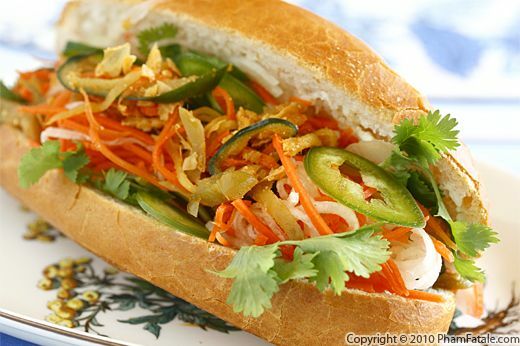 The sandwich consists of cilantro, fresh chiles, pickled carrots and usually a meat filling (grilled chicken, bì which is shredded meat with roasted rice powder) or sometimes a vegetarian filling, served on a baguette, spread with mayonnaise on one side and butter on the other. For the veggie option, I normally fill the sandwiches with bì chay (shredded tofu with roasted rice powder). But this time, Aunt Danielle stopped by and we made mắm chay. She knows it's my husband Lulu's favorite, so she makes it very often. As I've said before, Aunt Danielle is a sweetheart and an amazing cook, except that she does not share her recipes. She used to run a successful restaurant in the early 90s. She taught me a lot of Vietnamese staple dishes to cook for the family until she found out about PhamFatale.com through her friends. I had to confess and she was not happy. It's funny; family and friends are a lot more reluctant to share their tips and secrets with me, so I have to do a little bit of recon and intelligence gathering. In the end, Aunt Danielle hasn't entirely showed me how to make mắm chay. We prepped and mixed the ingredients together but she hid a few tricks from me. All I can tell you is that there are a lot of ingredients similar to bì chay involved, such as fried tofu, bean thread noodles, dry roasted rice powder (thinh) and seasonings (fried garlic, sugar and salt). What makes it different from bì chay is the addition of galangal (a type of ginger), young pickling cucumber, chayote squash (trái su su), ripe papaya, fresh pineapple and dried daikon radish cured in brine. Even though the sandwich is reminiscent of the typical French jambon-beurre (ham and butter sandwich), bánh mì provides a taste of Vietnam. Lulu's been addicted ever since I first introduced him to the Vietnamese version, and if you try one, you will be too!